Summer is perfect for enjoying colorful, crisp, fruits and vegetables. They are refreshing due to their high water content, delicious, and easy to prepare – especially since you don’t have to cook them! Salads are a great way to plan a balanced, delicious meal – start with your favorite greens, and summer veggies like bell pepper and tomato, then add leftover grilled shrimp, chicken or lean meat. Sweeten the greens with fruits and you have 3 out of five food groups. Remember to pay extra attention to the “extras” like croutons and dressings so calories stay in check. Need some inspiration? Here’s a tasty recipe to try tonight! 1. Place chicken and ½ cup marinade in a 1-gallon recloseable food storage bag; seal. Toss to coat. Place in refrigerator and marinate 30 minutes or up to overnight. 2. Prepare grill to medium heat. Remove chicken from bag; discard bag. Place chicken on grill; grill, turning once, 10-12 minutes or until internal temperature reaches 170°F on an instant read thermometer, brushing with additional marinade as needed. 3. Place nectarine halves, face down, on grill about 5 minutes after chicken. Grill until caramelized, turning once (about 5 minutes), brushing with additional marinade occasionally. 4. Slice chicken and nectarines. Toss spinach with ¼ cup marinade. Add raspberries, blue cheese and walnuts; gently toss. Divide salad among 4 dinner plates. 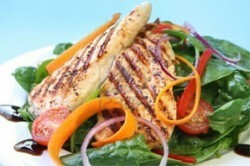 Top each salad with chicken and nectarines.